Today, we visited the top IT Companies – Facebook, Google, LinkedIn and Apple! What a feeling! ! 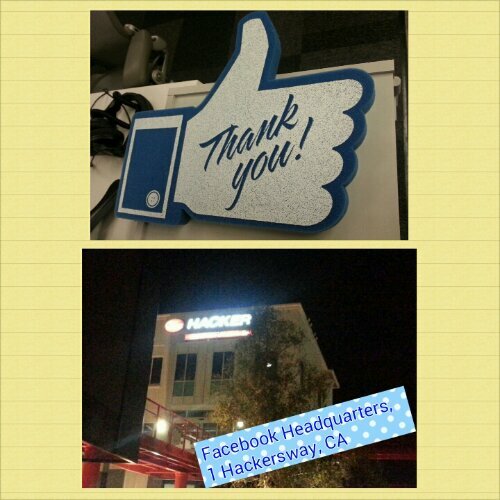 A friend of mine works in Facebook so he took us around and inside Facebook. ..that was something. ..we all are so used to using Facebook and seeing it from the inside was amazing! ! The campus is huge and lovely. Everything you need is there within the campus. .from food to laundry to games! ! The inside is like any other office but not the usual cubicle concept. ..its more informal. I was super excited to see Mark Zuckerberg’s desk & conference room! I was amazed to see that he doesn’t have a cabin to himself. .sits amongst other staff on an ordinary desk. ..impressive I must say. I am not sharing the inside Facebook photos at the moment. .but shall definately share them if my friend approves of it. After spending around an hour in Facebook, we moved to check out Google. Its just a few blocks away from Facebook. Google has a huge campus and again outstanding infrastructure. 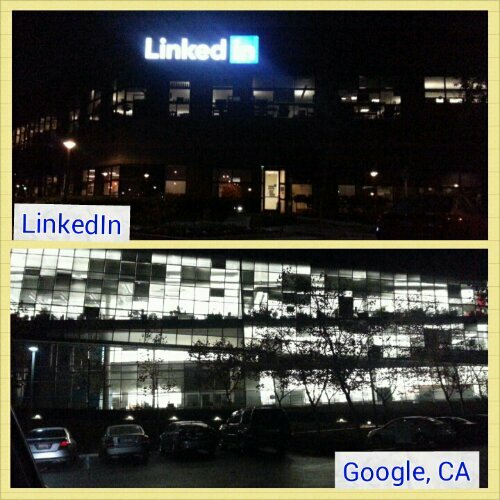 While passing Goggle, we came across LinkedIn as well! I m told LinkedIn has a very good Indian restaurant within its campus. Finally, we went to Apple!! Wat a feeling. ..I wanted to go to Apple for a long time and the feeling was overwhelming! 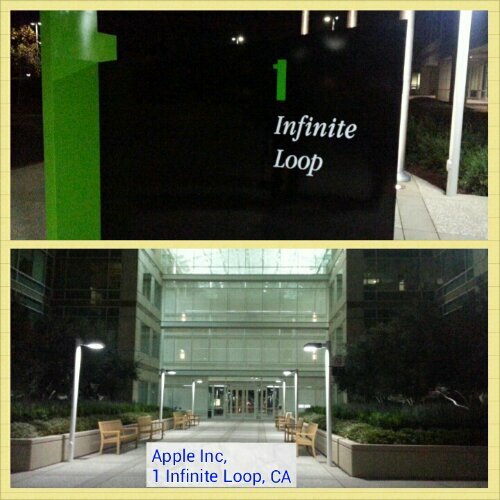 Had recently seen Ashton Kutcher’s movie Jobs based on Steve Jobs… so some of the locations in campus reminded of that! What vision Steve Jobs might have had when he started Apple! Incredible! ! I plan to do some local site seeing in San Francisco tomrw. . Shall keep you posted. Have fun & take care. STEVE JOBS.. the man who changed the world. ..the man who dared to think differently. . The man who made people want things that they never knew existed! And last but not the least. .in my opinion, the makeup artist or beautician or designer of technology. This man knew how to beautify a product. .he had the knack of making his products stand out from the lot. 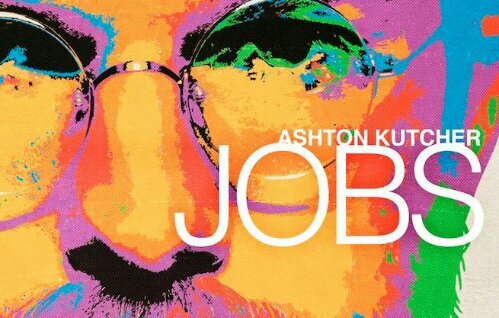 I was super excited when I heard that a movie was being made on The Steve Jobs! My expectations were sky rocketing. .but then. ..won’t they? It’s Steve Jobs your taking about! 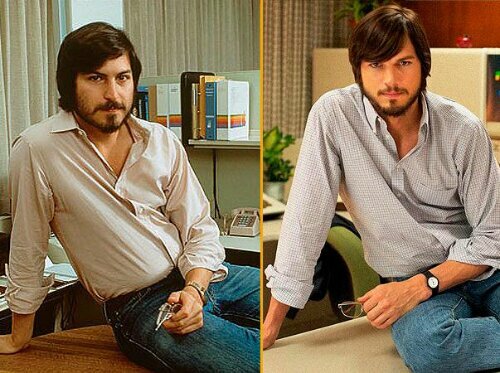 Ashton Kutcher as Steve Jobs has done an outstanding job! His looks, his smile, those idea striking eyes & the walk of the legend. ..he got it all right! It actually shows the amount of effort Ashton Kutcher has put in to play this role. All other characters are also well played. The background score in the movie is also nice. However, i was left a bit disappointed. I thought the story was a bit weak. There were so many things that I would have loved to see in the movie. ..like Steve’s India visit. .what were his thoughts then. .his emotional turmoil when he got cancer.. how he turnaround Apple after coming onboard again… how he was a changed personality etc. The movie captures his arrogance, his passion for his work etc well but I felt something was missing. Steve Jobs has given some outstanding speeches in the past. .they could have used those a bit more. The legendary video where his designed computer introduces its owner I.e Steve Jobs was also not used. ..I mean, I just felt a gap..I wanted to see more facets of Jobs. Overall, for Ashton’s performance I would give him 5/5. But, for movie per se, I would give it a 2.5-3/5.